They're every mother's first bouquet. To a toddler nothing could be more beautiful than those fuzzy, golden flowers. Surely Mommy will love them too! Unfortunately, most people don't greet dandelions with the joyous glee of a small child. Spring's arrival is announced by a rising cacophonous chorus from members of the species 'Lawnus Harrumphus' emerging from their winter dens to discover dandelions blooming everywhere. Immediately the anti-dandelion forces muster every physical and chemical method available to eradicate them. Dandelions are North America's irrefutable example of the power of peer pressure. Oh, there's no official society for the suppression of dandelions, no government inspectors, nor municipal fines. Nevertheless people have incited animosity to this colourful spring flower to the point where corrupt politicians, accountingly-challenged CEOs and criminal biker gangs might have their nefarious exploits excused by a forgiving public. But, let it be whispered that they tolerate dandelions and punishment will be swift and sure. Condemnation from all levels of society will soon force them to conform. This attitude would have puzzled our ancestors. Tenth century Arabian physicians recorded dandelion cures. In monasteries, castles and cottages, medieval gardeners cultivated dandelions. They were relished as vegetables, served as salads and recommended as medicines. Healers of the Middle Ages couldn't isolate the minerals and vitamins in dandelions. They worked from observation. And, when ancient monks and village wise women treated their patients with dandelions, they noticed beneficial results. The dandelion, we now know, holds greater amounts of vitamins C and A than almost any other vegetable or fruit. Consequently it was very important to medieval people at risk of scurvy after long winters with no fresh fruits or prepackaged vitamins. The greens are rich in vitamins B1, B2, iron, calcium and copper. Ancient herbals offered numerous recipes for dandelion teas, tinctures, and beers. North American homesteaders, showing some of the same folk wisdom as well as an understandable desire to forget the dreary winter, made dandelion wine. Many a country Saturday night was enlivened by a jug of this brew which had the added advantage of providing necessary nutrients. "Good and good for you!" Think of the marketing potential! Humans aren't the only ones to benefit from the dandelion in all its stages. Both wild and domestic bees sip from these earliest of flowers. Canada geese and pheasants forage on the greens and seed-eating song birds feast on the seed heads. Why is such a useful plant so detested? To be fair, dandelions do exude an ethylene gas which discourages the growth of neighbouring plants. And the long tap roots bring up iron, copper and other minerals from deep in the soil. 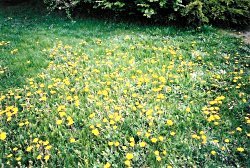 But, when dandelions are mowed and the clippings left on the ground to decompose, those minerals are then available to shallow rooted plants which couldn't have reached them. No, the dislike of dandelions isn't based on science. It's a reflection of our desire to impose strict order on nature. A lawn dotted with yellow blooms, buzzing with bees which will soon pollinate other plants, a yard where a casual pheasant may wander in hopes of a tasty meal of dandelion leaves, have become symbols of someone who's either too lazy or too rebellious to keep up the standard, a sign of someone not maintaining control of her allotted portion of this chaotic world. Humans, say the scientists, evolved in a savannah-like region. It was dotted with copses, ponds, rocky outcroppings, shrubs and grasses. In fact, suburban yards have been described as attempt to recreate that primitive landscape. Did we take the wrong path on the way back to our roots? That original savannah was anything but simple and uniform. It was complex and diverse. Yet we not only survived on the variety of available plants, we eventually domesticated some as the first cultivated grains. Despite the anti-dandelion folks, there are encouraging signs. Gently trimmed 'natural' yards are becoming popular. Some schools and cities just mow dandelions on playing fields and parks, instead of trying to eliminate them. Even dandelion wine is making a comeback. North Americans may never equal the French in their zest for dandelion culinary treats, but we may, in time, think of those cheerful blooms as signs of health in our yards and communities.